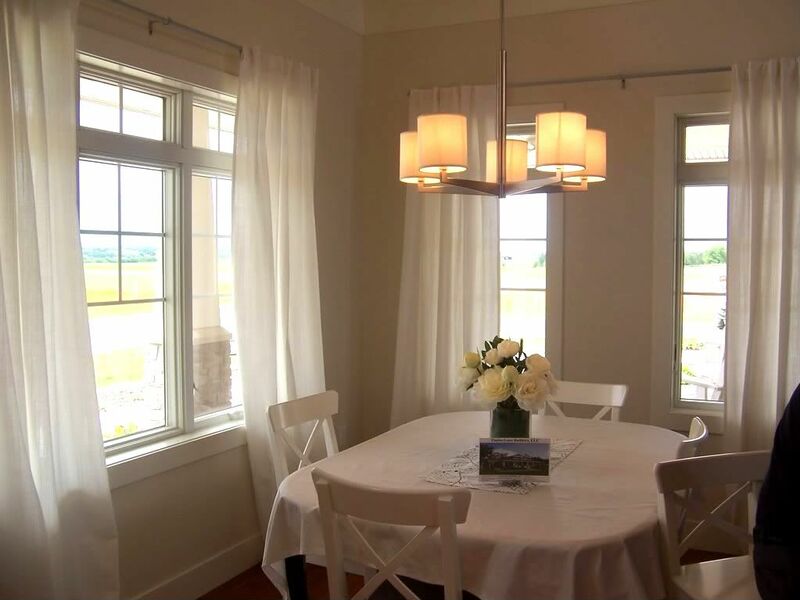 This is the last 2008 Parade of Homes home I have to share before we move on to the 2009 Homes–and it was my favorite of all of them! 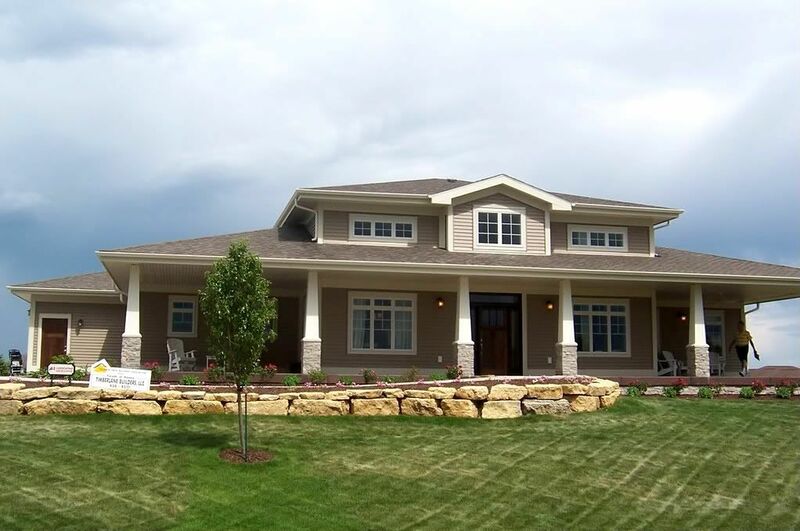 Built by TimberLane Builders and located in the Bristol Gardens near Sun Prairie, WI, this home was custom designed to be Americans with Disabilities Act-compliant. 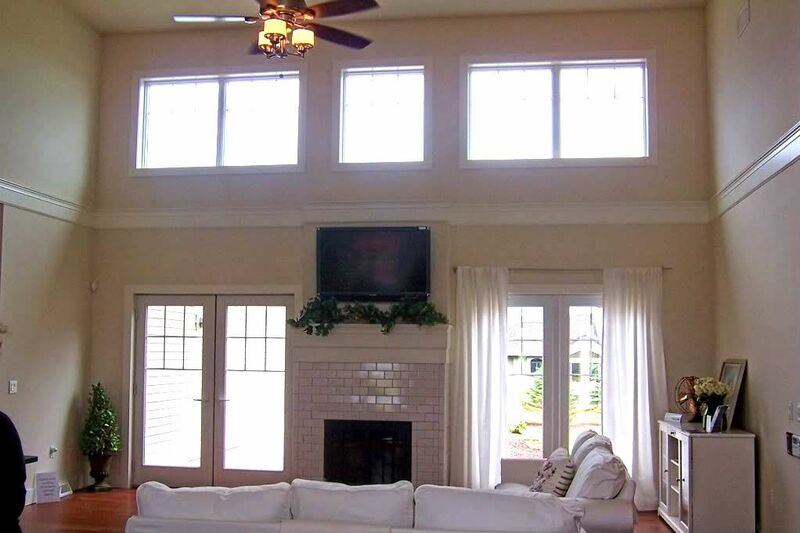 The home boasts over 2,505 square feet of finished area and plenty of room to grow with a large unfinished lower level. It has wide hallways and doorways, amazingly high celings (16 feet tall!) and even an elevator to the lower level. 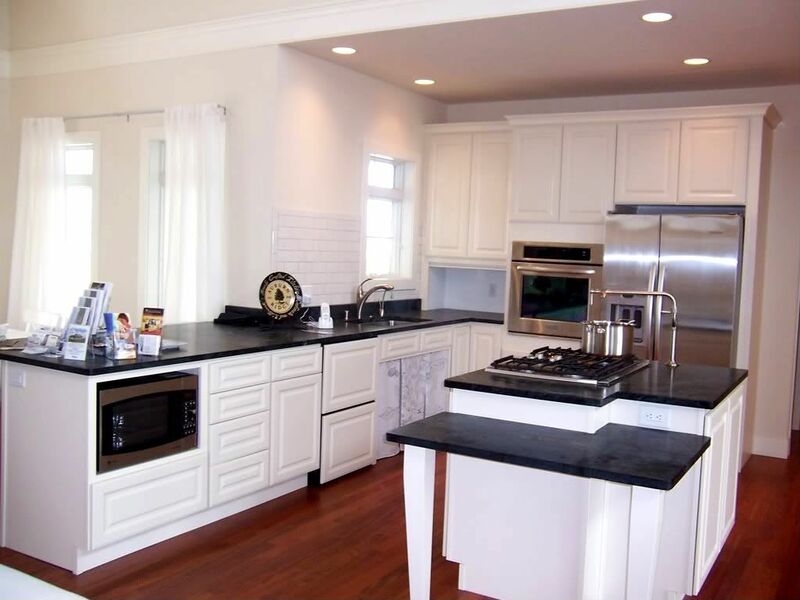 The home is so spacious and beautiful–and not over-done–which made it easily one of my favorites. This study/library just knocked my socks off. 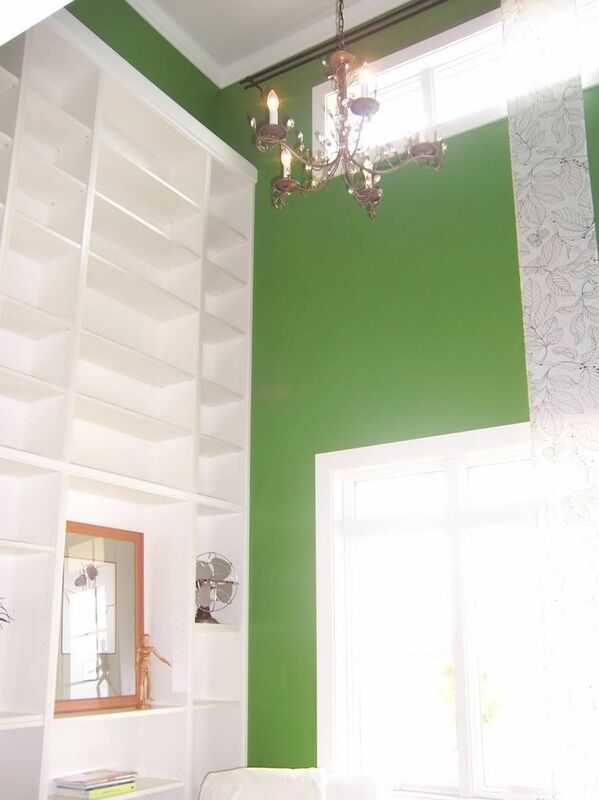 It has a soaring 16 ft ceiling, with floor-to-ceiling built-in bookcases and a ladder on a rail to get to the higher shelves. The ceiling was so tall that I couldn’t fit the entire space into my shot, so I just snapped the picture from the ceiling down. 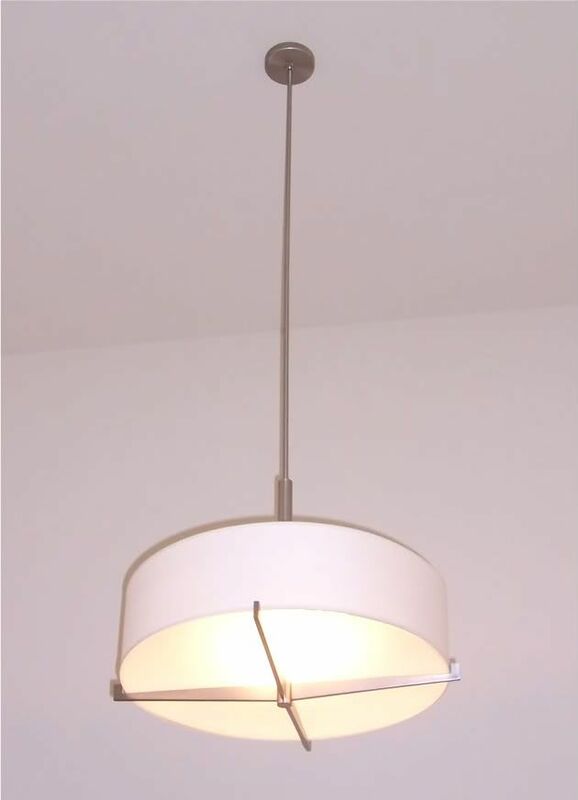 You can see the tops of the furniture toward the bottom of the picture which gives you an idea of how tall this room is! The surface area of the room was small, but overall it was gorgeous! 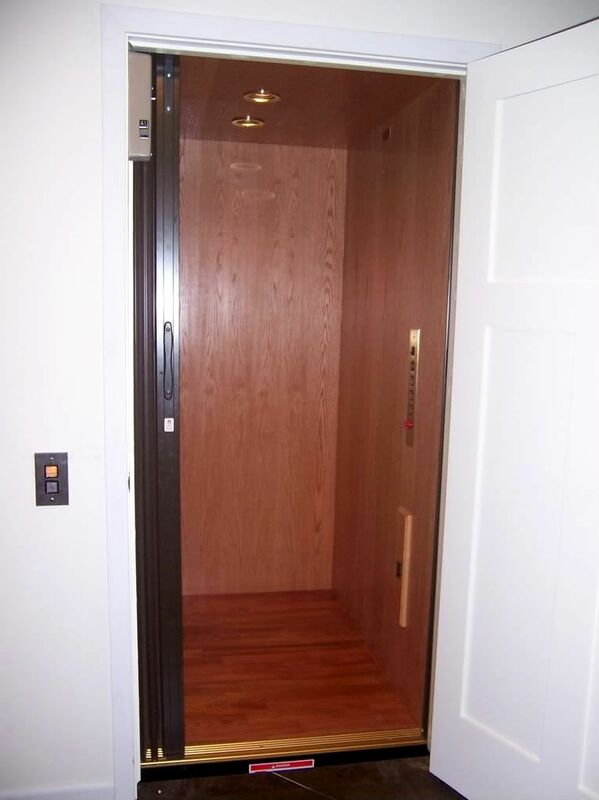 The elevator to the lower level was in the hallway near the great room, and the door opening to the elevator looked just like a regular wooden door–not some industrial metal elevator door, which was neat. From the living room, looking back toward the entryway. The open door on the right wall is to the study/library, and the open door on the left (the one the person is behind) is the elevator, with the hallway leading to the bedrooms in the background. 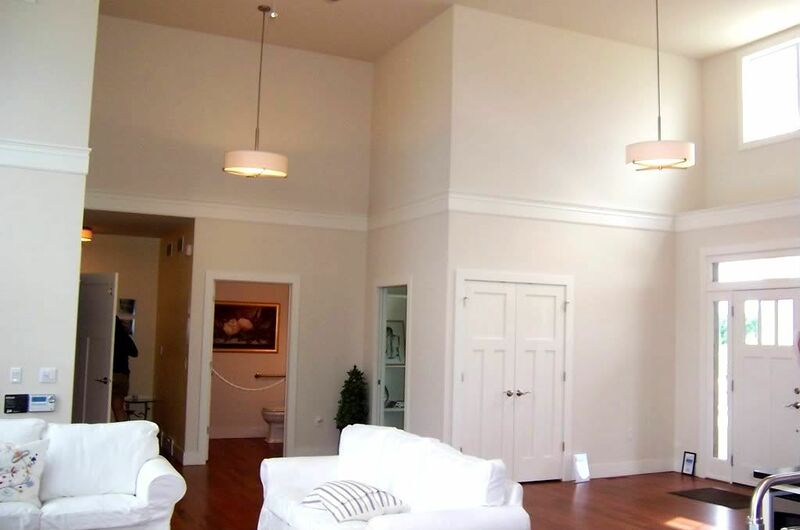 Just look at those tall ceilings–amazing! 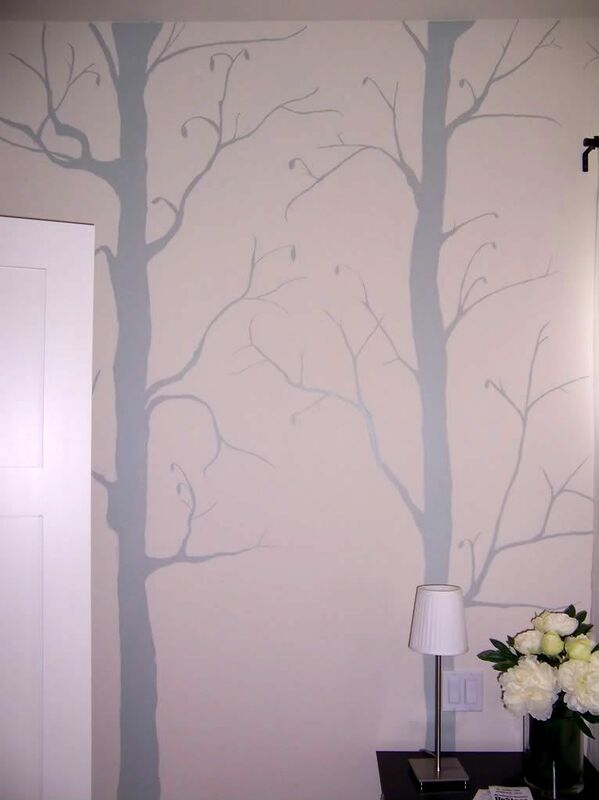 I absolutely LOVED the hand painted tree branches on the back wall of the master bedroom! 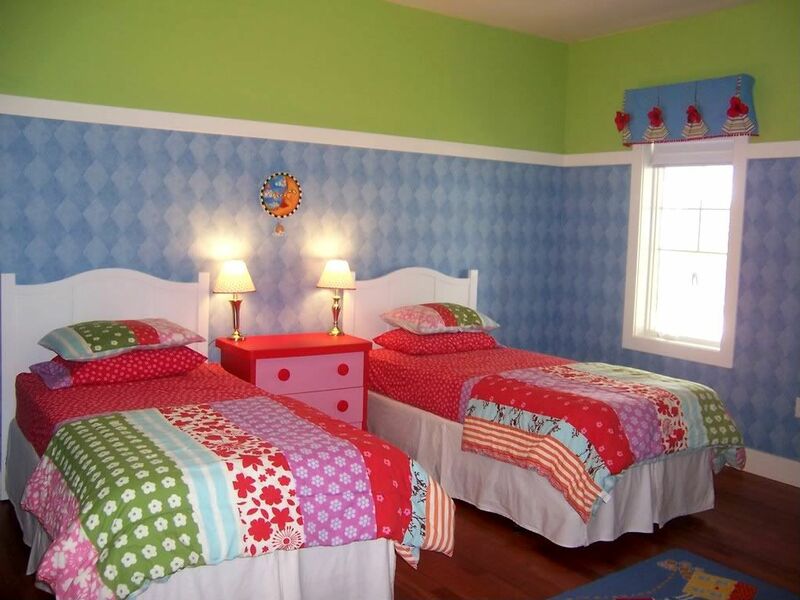 They were done in a silvery blue/gray color, and the rest of the walls were painted the same blue/gray. It was gorgeous! 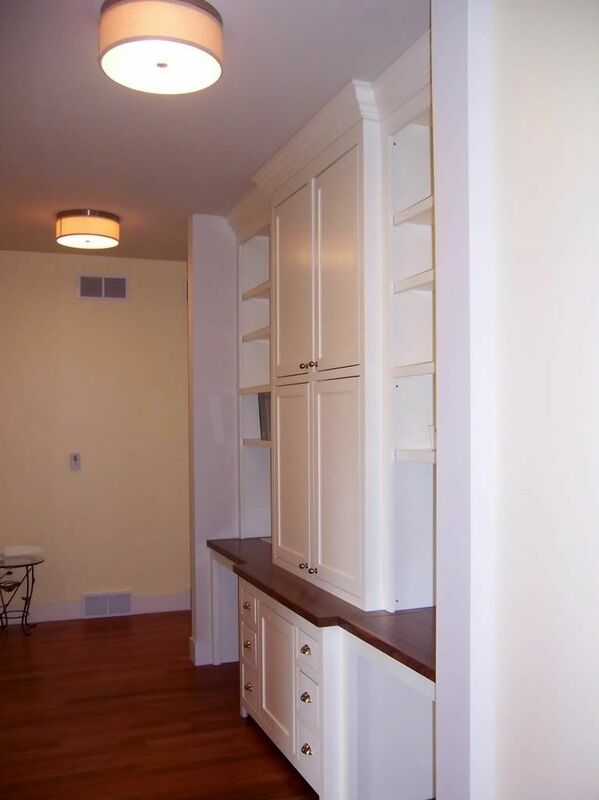 So there you have it–the last of the 2008 Parade Homes I have to show you. Hope you enjoyed them! More to come after the 2009 show! Thanks for posting this series. These homes are drool worthy for sure! 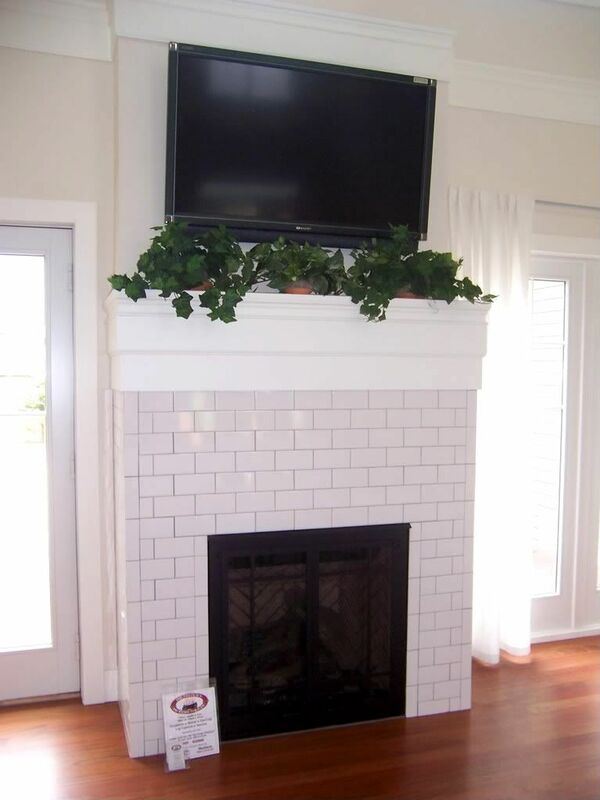 Normally I’m kinda eh about these model homes…you know, you’ve seen one 16 ft ceiling, you’ve seen em all but this house, I loved it! It was different and interesting and those blue trees…want!! ezza-it is a ranch with a basement, but it was built for someone with a wheelchair. thanks for sharing! Amazing. I love the trees too in the master room. gorgeous. Beautiful home. 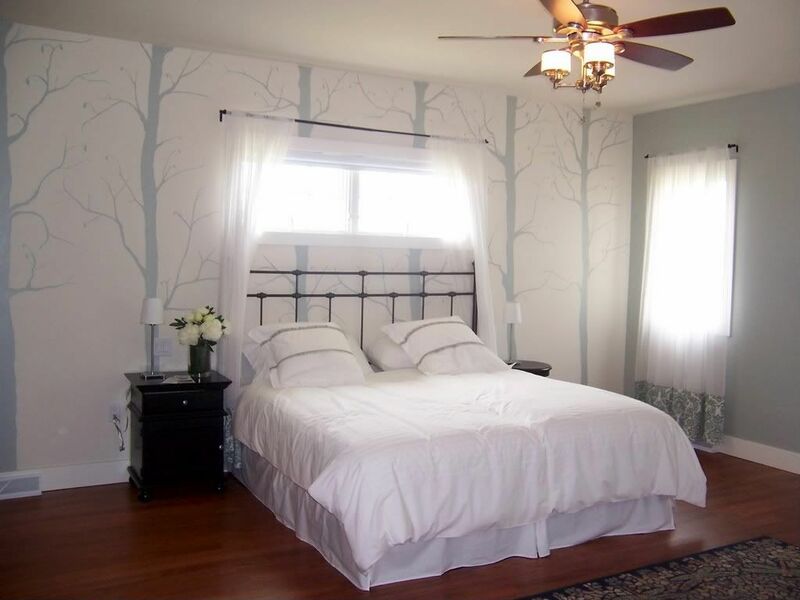 I especially love the tree is the master bedroom. 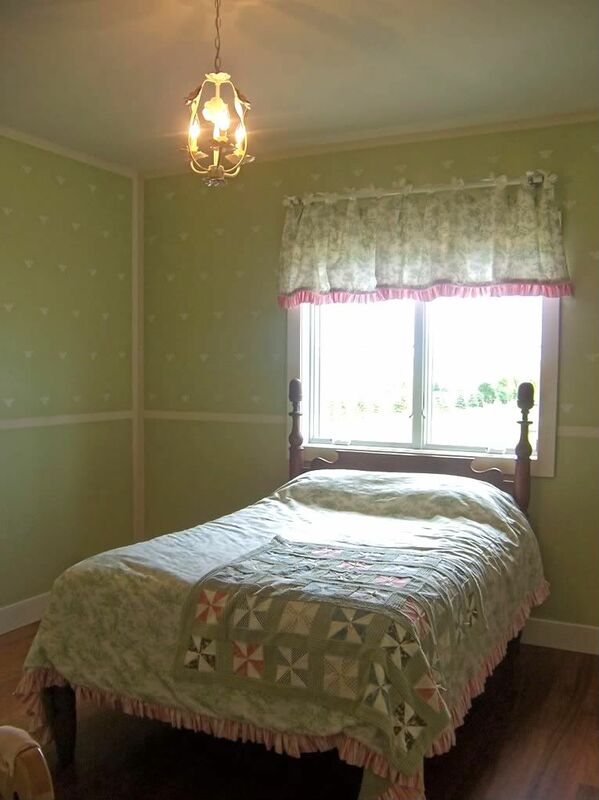 I think I will steal that idea for our bedroom as I am at a total loss for what to do with our room. I agree with Heather: I is ironic that it is handicapped(handicapable?) friendly, yet the bookshelves are 16 feet tall. Maybe they expect people to have a monkey to retrieve their things. While all the homes you’ve showed us are pretty, this is the first one I actually like. Some of the others seemed to just be a show of how much money the owners had and made their homes feel like museums–this one actually looks like someone lives here. Love love love it! @Ezza–glad to hear you love the new blog design. Thanks! And ditto Anonymous–the house is a ranch with a basement but one of the family memmbers is wheelchair bound, which is why they have an elevator. @My name is Heather–I had that same thought initially, but in speaking with the rep who showed this house he informed me that the young family who would be living here was moving in as soon as the Parade showings were over, and they were part of the design and building process from beginning to end. So that library with the tall bookshelves was what they wanted. Thanks for clearing that up! 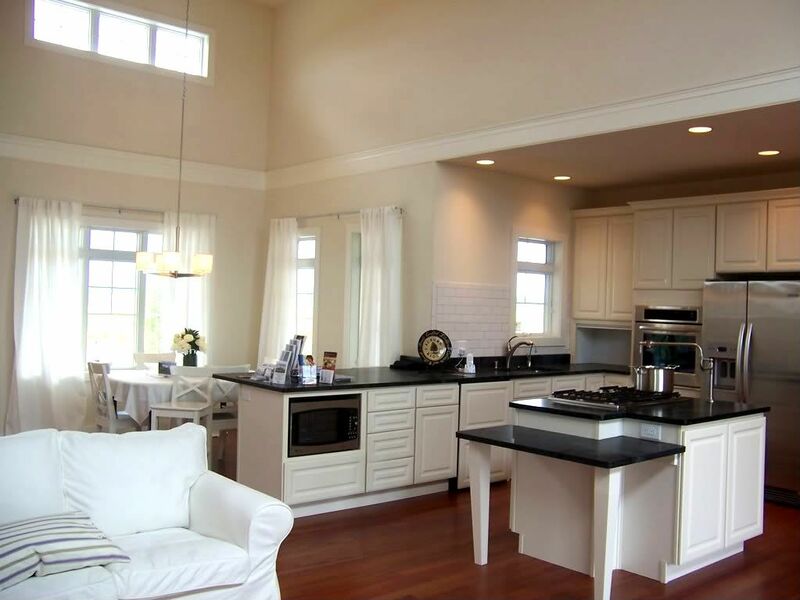 Sometimes I forget that parade of homes houses actually already have owners! Um, swoon worthy kitchen. LOVE those branches. Thanks for sharing. 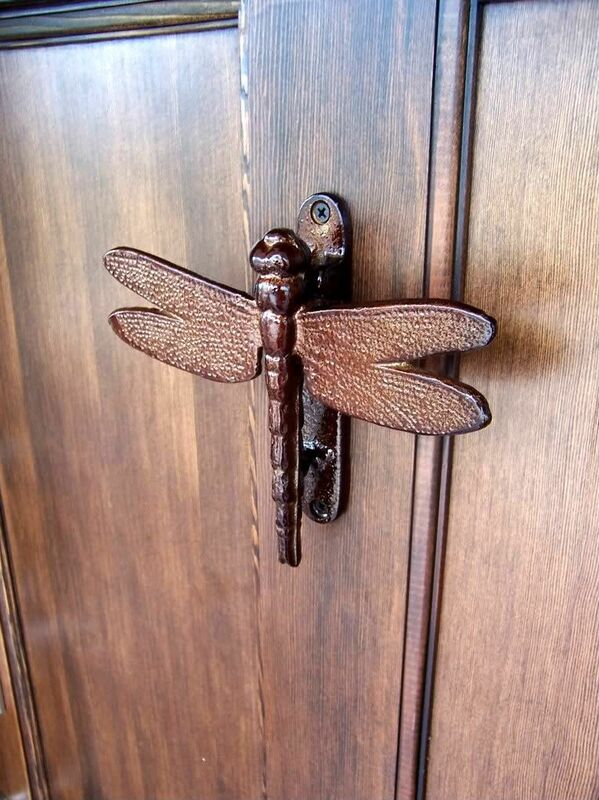 Where might one find that dragonfly doorknocker ?